I cannot see any way in hell that this results in more ticket sales, and the revenue generated will be minimal in comparison to the loss of more fans. Tulane (HEAR THIS TROY) needs to do everything it can to build the fan base, not everything it can to squeeze a FEW more dollars out of the die hards that follow pathetic athletics. Give tickets away rather than have the stadium 1/2 (at best) full. This is nothing but an attempt at a money grab that looks like it's counter productive to building a fan base. Well, it nearly triples my annual donation... from $500 to $1400. It sure feels like a money squeeze as opposed to attracting more fans or rewarding loyalty. Mine will quadruple as it stands. More sports and seats the more you feel it. Done with basketball, baseball may be next to make up for the increase. That is a shame. Like you said Ii does seem like this plan punishes the loyal fans like us that buy season tickets for all sports. They are satisfying people that just buy them for one sport. They never miss a chance to stick it to us. so it is better to just not buy season tickets and just go to the games you don't have any other plans on that day. Brilliant Tulane! For supposedly being such a smart and prestigious University, the idiots that run it will burn it to the ground. As a die hard fan over 35 years, I quit buying season tickets 3 years ago. Saving $$ and only going to the games that intersest me. 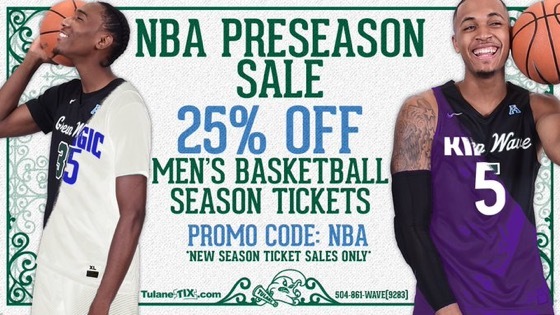 They keep doing stupid things like this and most of the NOLA area won't even bother with any Tulane sports. I gave up season tickets last season after they tried to screw me for a donation for 2 tickets in a section that had literally 7 total season tickets sold in the entire section (this year it was 5 when I checked). I bought a ticket or two to the home games i intended on going to in the same exact seat and saved about $600. This year I rebuked their attempts to attract me back to season tickets and spent $40 for the Wake Forest game to sit in my seat. I will likely attend SMU and Navy and will buy that single ticket as well. They have been squeezing blood from stones for years and giving us nothing in return. My family and I had season tickets for 40+ years and I never imagined ever giving them up. Now that I have I couldn't be happier with the decision. I save $6-700 per year if not more and only buy tickets that I know I will use. There is absolutely no shortage of great tickets to buy either for any game. It was also alot easier for me to attend game at the Dome so It's not like I can make every game anymore anyway. Can someone explain to me how this idea is supposed to increase season ticket sales? You can list stats all day until you're blue in the face, but the one stat missing from all of this is winning, or the lack thereof. This plan makes sense, is justified, and WORKS if there are competitive and winning Tulane teams on the field. Again, priorities are backwards with Tulane athletics. Produce a WINNER, then there will be a DEMAND. Once again Tulane is being deceptive. They tell you that only 6% of season ticket holders will pay more. 6% of those season ticket accounts buy over 50% of all tickets sold. They fail at raising new money so once again they get it from its most loyal supporters. They should have introduced two plans. 1. NEW MEMBERS. A plan that opens up a door to a lower cost of entry to purchase season tickets for a single sport as they are attempting to do here. As it relates to Football (in a vacuum) the plan does achieve a less costly option for the 81% of fans they reference that purchase 2-4 tickets in just one sport. This is assuming a 30% discount on the tickets ($250/seat in 2018 vs $175/seat in 2019 - as illustrated in the video), I haven't seen if there is an actual price per section that has been published. So you want 2 tickets in Westfeldt 1? 2018 it would cost you $2,500. In 2019 it will cost you $1,350. 4 tickets at 50 yard line on the west side? $1,300 in 2018. $960 in 2019. Across the board in Football tickets are less expensive in all but one case when 4 or fewer tickets are purchased. However it does not make sense that there is an increase cost in Westfeldt Terrace 1 and Premium West II when 5 or 6 seats are purchased. Now, did they discount them enough to really drive a measurable influx in new season ticket holders. I'm sure most would argue no. 2. CURRENT MEMBERS. They second plan should attempt to drive the one sport ticket holders to 2 or more sports. Any successful sales person will tell you the easiest person to sell to is an existing client. They are dis-incentivizing single sport ticket holders. They should be saying that only 19% are multi-sport today and our goal is to have 25% or more next year or the year after. Instead they are setting up a system that will negatively validate their plan. They'll see multi-sport ticketholders drop and thus seem to validate that their new plan to focus only on single sport tickets is the right approach because nobody wants mutliple sport anyway. It's crazy. And no doubt they should not penalize the current multi-sport ticket holders at all. The 19% they reference that will be affected are the life-blood of the supporters. If they think the term die-hard fan means that they'll support at any cost they're crazy. And if you read the fine print on their video, they state 67% of season ticket holders will see a price decrease or no change. That means they are admittting that 33% are negatively affected. That's huge! It also means my math doesn't add up (or my assumptions are incorrect) in my above single sport pricing analysis. They can right the wrong by implementing some sort of supplemental plan for multi-sport discounts on the seat donations. But I can't imagine the backlash that the athletic department will get from their larger donors to the program. This stadium was built with a flawed belief that they could operate like LSU and other major winning programs to fund the stadium. What lots of those major schools are finding out is taxing the piss out of your fans eventually wears them down and backfires unless you are consistently a top 5-10 team in the country. The pendulum is slowly swinging back in the other direction as game attendance is down drastically due to costs and tv options. As usual we are far far behind the curve. There is no demand currently at Yulman. You can’t susccessfully tax people when the demand is zilch. You are just going to whittle you season ticket base down year by year. It’s comical that one has to navigate and understand all this foolishness to buy season tickets in a stadium that is more often than not 20% full. It’s just foolish to tax the few people who support everything even more. Especially when the department has been woeful in all 3 major sports for quite sometime with the exception of a 2 year blip in baseball. Eventually people, as they already have, are just going to withdraw and wait for a good team in a successful sport against a good opponent to buy single game tickets. This is fixing to be a disaster. How do you charge fans a seat tax to watch this crap? Go out around the country and raise money. Quit doing this nonsense. Got Dannen’s version of the Playbook in the mail today. Going to be dropping a bunch of tickets. Don’t see how this will increase season ticket sales. I can only guess this has been in the works under the assumption this past spring and summer that football would be a 7-9 win team with basketball improving and baseball making the postseason. Dannen is betting on the coaches he has hired. Having watched said coaches, I have to say he’s got some serious balls. Actually I think this is a classic case of out thinking themselves. The tax laws changed and they freaked out thinking they would lose a lot of donors. i don't think that's the case. The requirements that were in place didn't provide much of a tax break. I think most would have continued giving what they gave. They should have waited one year and seen what would happen. Troy do the right thing and scrap this crap. Don’t embarrass us and yourself any further. Otherwise step down. Did anyone attend the Seat License forum today? I'm sure that it consisted solely of the athletic department admins explaing why season ticket holders should be excited to pay more to attend sporting events. Anybody thinking about donating to these losers think long and hard about what you’re doing with your money. A donation to Tulane is you validating these performances. got booklet in mail today.....what a joke! Fan base is already near zero so you jack price on seating priority which will diminish it more. I worked at a funeral home that was lagging behind the competition because of outdated facilities,constant turnover and refusal to advertise so what did the owner do-he raised the price of services which caused the business to close .Maybe this act of stupidity will cause higher ups/boosters to demand change and get rid of Dannen and get serious about being competitive. Letters went out today informing season ticket holders how much they will now owe if they want to continue to purchase current season ticket seats in the 3 men’s ticketed sports. I also received my St Tammany Parish Tax bill in today’s mail. Great timing Tulane. Merry Christmas folks.